The USAF is kicking around 'creative concepts' under which it could re-engine its fleet of 74 ever evolving B-52H Stratofortresses. 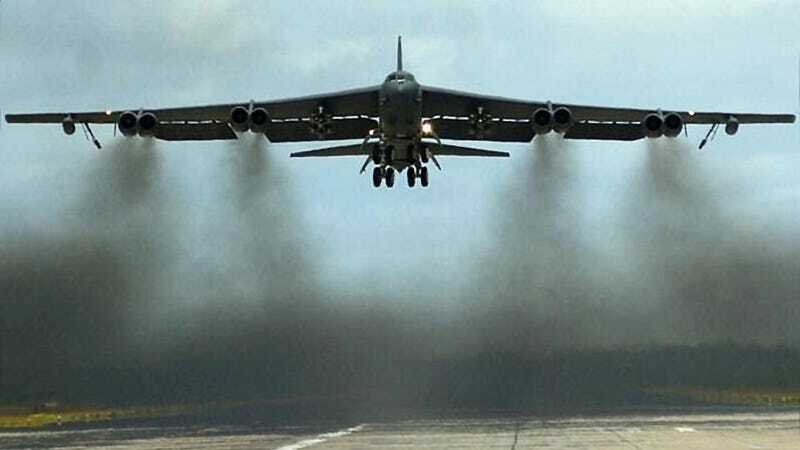 With the bombers remaining in front-line service until at least 2040, and considering that flying with eight 1960s vintage TF33 engines is far from fuel efficient (burning 3k gallons an hour), re-engined B-52s should make great financial sense. "To go out and buy new engines for the B-52, you'd have a really hard time fitting that into our program, but that's why we're interested in a public-private partnership, which would be a different way to amortize those engines over time and pay for them in the savings that they actually generate, instead of paying for them out of savings that you hope for.... The idea is in a public-private partnership, somebody funds the engine and then we pay them back over time out of the fuel savings, which are generated out of the new engines. Our government has a way to do that with facilities. We don't have a way to do that with airplanes, and we are exploring whether there are alternative ways that would let us do that... Look at what the airline industry is doing — they're all re-engining. Why? Because it saves you a lot of money. If there is a commercially available engine which can give a 25-30 percent increase in either range or loiter, you have my attention." Such 'creative financing' methods for upgrading existing or procuring new capabilities have become increasingly talked about over the last two decades within the DoD, with leasing military aircraft and unique public/private usage schemes becoming a norm for other governments around the globe. Today, the DoD upgrades facilities and buys vehicles against future energy savings but they are not allowed to do the same with combat aircraft. If the legal issues can be solved and doing so becomes a possibility, there is little doubt that it would be a major boost for both the jet engine industry and for America's combat aviation forces' capabilities. This is especially true when you take into account the USAF's rapidly aging aircraft inventory. This is not the first time the iconic bombers were rumored to be getting new powerplants. B-52 re-engine schemes date as far back as the early 1980s. Although a serious push in the late 1990s and early 2000s, in which the B-52s would get a quartet of General Electric CF6 high-bypass turbofans, was shot down due to a study by the Air Force that concluded spending $4B on new engines for the B-52 fleet would end up saving 'just' $400M, and that is only if the jets flew another 40 years. In 2004, the USAF independent Science Board study on the subject found that this study was totally inaccurate as it did not factor in tanker gas that costs around 7 to 10 times more than gas loaded on the ground at large US bases. Nor did it take into account the high cost of gas that had to be shipped to exotic locations that are frequented by America's long-range bomber force, such as the island of Diego Garcia. The Science Board's findings are over a decade old now and gas, at times, has over doubled in price over that decade. Had the faulty study not derailed the B-52's re-engining, doing so would have saved massive amounts of money. Not only would new engines make the B-52 fleet more economical and reliable to operate, they would also extend its already gargantuan range and loitering time, as well as its takeoff performance and its payload lifting abilities. This is something that the airliner industry is well aware of and reworking older designs with new powerplants is a very hot business category for both Boeing and Airbus right now. A B-52 was used for testing the TF39 and CF6 engines for the C-5 Galaxy program in the late 1960s. One candidate for the B-52s re-enginging is the Pratt & Whitney PW2000, otherwise known as the F117 engine in DoD parlance. This is the same engine that flies on the C-17 and the 757 and Pratt & Whitney has supposedly put forward options that would keep the B-52 an eight engine aircraft via using a special nacelle housing two F117s mounted on a single pylon. This would also help with engine out controllability compared to going with a four engine setup. Considering that the C-17 will be out of production this year and the 757 line has been shuttered for years, the USAF may be able to strike a very favorable deal with Pratt & Whitney for the engine type. Still, competition could fierce, with longtime B-52 engine candidate General Electric very likely to compete with either their CF6 or CF34-10. Rolls Royce would also likely bid on the project. As with any weapons platform it seems, as more money is dumped into it, more money gets dumped into it. An engine upgrade could lead to the B-52 receiving other missions, such as working as a standoff jammer and electronic attack aircraft or working as a long-endurance communications node or radar surveillance and targeting platform. With new engines and the new economy and capability boost that comes along with them, the B-52 may last far past its current 2040 out of service date. Who knows, it is not out of the realm of possibility that the Big Ugly Fat Fucker could still be plowing the skies well into the second half of the century. Such a feat would be akin to flying a Sopwith Camel into battle today. Another byproduct of an engine swap on the B-52 will be the disappearance of the jet's characteristic long black exhaust trails, which will be a loss for some nostalgic types but a great victory for the environment.